What if my dog doesn’t understand that the pet door is locked? If your pet is the eager kind that runs towards the door at full speed, it’s a good idea to put up a signal stating the door is locked. No matter which type of door you choose, some pets will run head-first into the door when it’s locked – they don’t know it’s locked. It would be an unpleasant surprise from the pet’s perspective, and cheaper doors might break from the impact. To avoid this situation, many pet owners put up a ribbon or similar on the door to signal that it is locked. Many PlexiDor owners put the security plate in place to completely remove the temptation of trying to run through. 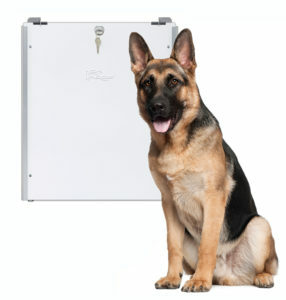 The PlexiDor security plate is delivered with the door. If it is attached often – if you for instance lock the door every evening – the sliding tracks may be a good investment. That way you can slide the plate into the tracks in seconds, and your pets will see that the door is off limits.